Ed Sheeran's promoter has told the BBC that fraud allegations made by ticket reseller Viagogo are "ludicrous". 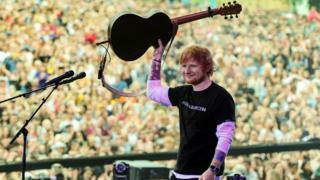 Viagogo claims that Stuart Galbraith's firm, Kilimanjaro Live, set up fake Viagogo stalls during Mr Sheeran's 2017 tour where it voided genuine tickets and told fans to buy new ones. Mr Galbraith dismissed the allegations and told the BBC that he doubted the claim would succeed. He said his firm still hadn't received any court papers regarding the claim. Viagogo's action, filed with a court in Germany, was "a diversion tactic" over the tickets seller's refusal to attend a commons select committee earlier this week, Mr Galbraith told BBC Radio 4's You and Yours programme. "Of course we're not defrauding anybody, it is ludicrous that they'd suggest it. "Their press release and court action was purely and simply a smoke screen to divert attention away from the fact they didn't have the courtesy to turn up at a commons select committee," he said. Viagogo said it could not comment on the Mr Galbraith's criticism because it was in the middle of legal proceedings. The Commons hearing earlier this week was on the issue of secondary ticketing. Damian Collins - the chair of the Digital, Culture, Media and Sport (DCMS) Committee, criticised the secondary ticketing platform for not attending the hearing, which would look into the site's practices. Many in the industry have criticised resellers, which have been accused of misleading fans by claiming they are official sellers of tickets, overcharging buyers or selling tickets that are invalid if they are resold. In April the manager of Arctic Monkeys, Ian McAndrew, called on the government to shut down Viagogo after tickets for the band's upcoming UK tour appeared on the site for as much as £2,200. Viagogo has long been accused of allowing touts to sell huge numbers of tickets for inflated prices, denying genuine fans access to tickets at face value. In August, the competition watchdog said it was taking Viagogo to court over concerns it is breaking consumer protection law. Viagogo has also accused Mr Galbraith of using its reselling site to sell tickets, and of threatening it when they refused to give him preferential rates. Mr Galbraith told the BBC he hadn't used Viagogo to sell tickets since 2011. "When they first launched in 2008 they were a legitimate peer-to-peer sales platform, and in 2010 and 2011 they sold about 1,500 tickets for us for a small range of our concerts, most of those at face value some were sold for higher prices"
"By the time we got to 2011 we realised they were as a company they were not reputable and not giving good customer services and were turning into nothing more than a platform for glorified touts and powers sellers."